Most of us have had at least one. Some of us have quite a few. So what makes cavities so persistent, keeping more children out of school than any other disease? Snacking on sweets and slurping sodas doesn’t help either. But rather than feel guilty, get informed. Q: What’s the difference between tooth decay and tooth cavity? A: Good question! Most people think tooth decay and tooth cavity are the same thing. But they’re not. Tooth decay refers to a gradual process during which bacteria in the mouth produce acids that destroy the surfaces of teeth. Over time, tooth decay can erode enamel to the point that a hole, or cavity, forms. Q: How do I know if I have cavities? A: Cavities are one of the first things we look for during a regular dental exam. X-rays allow us to diagnose whether you have dental cavities and how extensive they are. Sometimes a tooth cavity is visible to the naked eye; if you see black holes in your teeth, those could be signs. Another cavity red flag is a toothache or sensitivity to hot or cold food and drinks. Q: How do dentists treat dental cavities? A: Treatment depends on the size of the cavity and the degree of damage. Although many dental cavities are treated with fillings, onlays may be necessary to treat large cavities affecting the cusps of teeth, while cavities affecting the areas in between the cusps may be treated with inlays. In some cases, dental crowns are used to protect a tooth from further tooth cavity damage. Dental sealants are often applied to children’s teeth as a preventative measure against cavities. Still have questions about cavities or other dental problems? We are happy to answer them during your next complimentary checkup. Many people are unaware of the consequences of losing their teeth or the effects of wearing partial or full dentures upon their jaws and bones. When teeth are lost, the surrounding bone immediately begins to shrink [atrophy]. 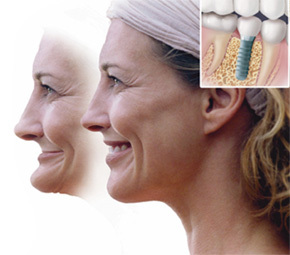 Implant treatment, for tooth replacement therapy, can be the optimal treatment plan. Here are some important facts to take into consideration. • Wearing dentures [plates] accelerates bone loss, and old dentures become loose because of this bone loss. It is possible to watch and wait for bone to disappear to the point where treatment success of any kind is in doubt. • At the end of a five-year period, only 40% are still wearing the original partial denture made for them. This is not a great testimonial for value and utility. Those lucky enough to have a functioning partial denture after 5 years are still losing valuable supporting bone. • Of those patients who wear a partial denture, 50% chew better without it. • One study showed that after 8 years, 40% of the supporting teeth [abutments] that the partial hooks onto were lost through tooth decay or fracture. • Patients with natural teeth can bite with about 200 pounds of force. Denture wearers can bite with approximately 50 pounds of force. Those wearing dentures for 15 years or more can bite with only about 6 pounds of force, and their diet and eating habits have had to been modified accordingly. • The average lower full denture shifts from side to side during chewing and is a significant problem that new denture wearers must get use to and accept. • Denture wearers have decreased nutritional intake, a ten year shorter life span, and 30% of denture wearers can only eat soft foods. • The single tooth implant success rate is above 98%, and unlike a bridge, the teeth adjacent to the implant are no more at risk than if no teeth were missing. • Implant-supported bridges or dentures have 95% success rates over 10 years without the severe loss of supporting bone. For bone maintenance, the health of adjacent teeth, the longevity of the restoration and patient comfort, implant therapy is the treatment of choice. Implants can restore chewing function to the equivalent of someone with natural teeth. If you have questions or want to know if you are a good candidate for implant tooth replacement therapy, please call our office. Our healthcare delivery model is a Better Way to Coordinate Care. In a group practice setting, we have an opportunity to share ideas and develop professionally. We believe we they can improve your patient care by having multiple dental professionals to consult with and refer to for alternative patient care under one roof. While most group practices have dentists with a single area of specialization, we have in-house expertise in prosthodontics, orthodontics and implant placement and restoration. A practice with a diverse array of expertise is designed to attract more patients seeking a one-stop shop for their oral health concerns. As dentistry progresses, it is impossible for a single dentist to know everything the discipline of modern dentistry has to offer. A multispecialty group fosters an environment of collaboration among many dentists – each an expert in a particular aspect of dentistry – to provide the greatest benefit to patients. So when you’re here for regularly scheduled routine maintenance, take advantage of having fresh set of eyes examine you when one of us is out of town or indisposed. We practice together because we have confidence in each other. We hope you will too. And when we can’t meet those needs, we’ll refer you out. If we can answer any of your questions or concerns about the Right Smile Center, please feel free to contact us. Dentists can usually spot a soda drinker. They are often prone to dental cavities and white spots on their teeth known as decalcifications, which are actually the start of new cavities. The cavity is an infection caused by a combination of carbohydrate-containing foods or beverages and bacteria that live in your mouth. Sweetened soda contains a high amount of sugar, a carbohydrate that can promote cavities. Soda may be even more damaging to the teeth than other sugar containing beverages because it is acidic as well. Before you drink a sugar-sweetened soda, the pH in your mouth is about 7.0, which is slightly more acidic than water. When the bacteria in our mouths are exposed to sugar, they metabolize it and produce acid. The acid causes the pH on the tooth surface to drop. At a pH of 5.2 or below, the acid begins to dissolve the hard enamel that forms the outer coating of our teeth. Over time this leads to erosion that causes cavities and ultimately, painful toothaches. If you have to have sweetened soda, it is better to drink it at one sitting than sip it throughout the day. Better yet, drink it through a straw in one sitting, to bypass the teeth altogether. If we can be of service please feel free to contact us. The second rarest profession: prosthodontist. There are only 560 of these dental specialists who are devoted to restoring and replacing teeth. Unless you work in this field, you probably haven’t encountered many prosthodontists in your lifetime. That’s because this is one of the least common jobs in the U.S., according to the Bureau of Labor Statistics’ Occupational Employment and Wage Estimates survey. Prosthodontists have received extensive training in designing, fitting, and placing dental prosthetics like dentures, partial dentures, bridges and particularly dental implant restorations. For more information about prosthodontics, contact the Right Smile Center. Dentist Chamblee, GA: What  Questions Do Patients Ask About Dental Implants? I read this article by Jim Du Molin and thought it might be interesting to readers and my patients. We (I’m assuming Jim Du Molin) conducted a survey that asked dentists what questions dental patients ask when considering getting implants. It turns out that there’s a real difference between the questions dental implant patients do ask — and which questions they should be asking. 1. How much do dental implants cost? 2. How long do dental implants last? 4. How long will it take to get my new teeth? 5. Does dental insurance cover implant surgery? 1. Am I a good candidate for implants? 2. What are the potential complications of dental implant therapy? 3. How much implant experience does the doctor have? 4. What is the healing time for my implants? 5. Can implants improve my appearance? 2. Will dental implant surgery be painful? 1. Am I a good candidate for dental implants?